For me, Mgahinga Gorilla National Park was the park of the skies. It seemed to be sitting in the clouds, rather it actually is in the clouds, since its altitude ranges from 2,227m to 4,127m. This national park was created with a particular purpose behind it and that is the protection and conservation of gorillas which inhabit this park. 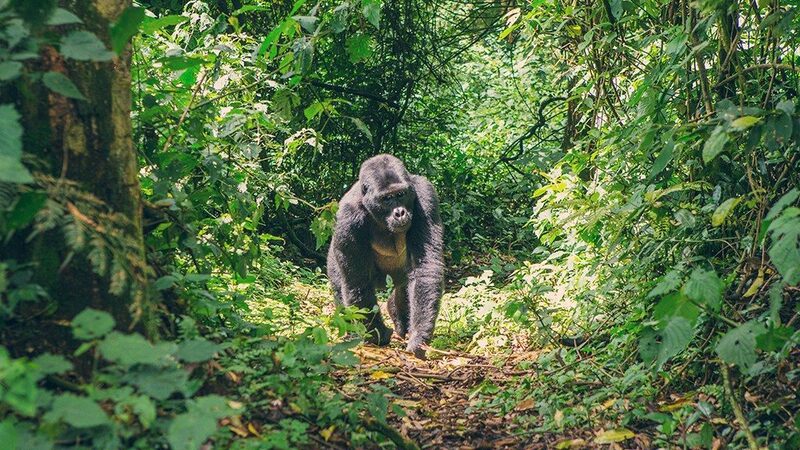 The very prospect of gorillas is both frightening and threatening at the same time, yet I was intrigued by it and its dense forests inhabited by gorillas. Also, the endangered species of golden monkey have found their nirvana in this national park of Uganda as well. This was another reason why I was so tempted to visit the park. My guide informed me that along with its ecological role, the park also has a very potent cultural significance, particularly in the context of Batwa pygmies. The people of this tribe were the first one to tread upon these forest floors; and to this day their knowledge of the forest and its numerous secrets is unchallengeable. Mgahinga Gorilla National Park, Uganda has another very striking feature which pulled me towards it. It has three conical, dried up volcanoes which are a part of the Virunga mountain range in which this park is situated. Each of these volcanic mountains possess very rich ecosystems which are a beautiful addition to the gorgeous scenery of this park. I was informed that even though this park is the smallest park of Uganda, however it is amongst the most important ones, since it offers habitat to the endangered species of mountains gorillas. However, one group of these gorillas have been habituated to this park. My guide was of the Batwa tribe and I gleaned a lot of information and secrets about the park from him. In a nutshell, this trip was one of the most informative ones I had had throughout my stay in Uganda. And of course, getting a glimpse of the jungle’s beast was a treat in itself.